Parboil the potatoes in the microwave for about 5 mins (this may vary according to your microwave). They should be almost cooked but not quite. Slice them into chunky wedges, place on a baking tray and toss in a little vegetable/canola oil. Season well with salt and place in the oven to crisp up for about 10 minutes or until golden. Zap the butter in the microwave for 10 seconds to soften it. Grate the garlic on the smallest eye and chop the parsley. Add to the butter with a good cracking of black pepper and pinch of salt. Mix well and shape into a sausage shape onto a square of clingwrap. Cover and twist tightly on either side to form a sausage. Place in the fridge. Mix the flour and baking soda (or self-raising flour) with some salt and pepper and the soda water. It should not be too thick - close to a smooth yoghurt consistency. 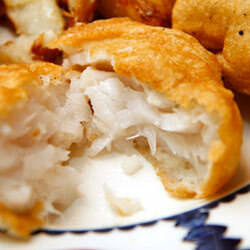 Dip the hake fillets into the batter and fry in a hot pan in some vegetable/canola oil. Serve the crispy wedges alongside the fish with a slice of cold garlicky butter on top to ooze over the fish. Reprinted with permission of Chef Caro.